I hope all of us are ready for good start of the week. My is amazing, LOL . I am so honored , I have been invited to be in GDT for Digi Bells DT. Yeepppyyyy! I will work together with some of my gurus in stamping and with the amazing, sweet and cute images designed by Elizabeth Bell. Thanks girls. Today we have a new challenge for you at The Crazy Challenge- Here Comes Spring! I am sure you will create some amazing Spring cards and will join the fun at the Crazy Challenge. Our sponsor this week is Sassy Studio Designs . The image "Hippie Chic" is provided by our sponsor. Isn't she gorgeous. I coloured her with copics. She is enjoying some Spring walk , lol. I love my new baker's twines from The Twinery . Here in the Netherlands is a rainy day, just a day for colouring and crafting , lol. I did made a card using the image "Latte" from Sampler Edition #2 by Elizabeth Bell exclusive for Susana's Custom Art & Card Design. I made my card to look like she is enjoy some Latte under the awning , lol. She is coloured with copics. I wanted to colour her in soft colours, but ohhh boy that's not my cup of tea. I love deep rich colours. I wish you all a fantastic Sunday with Latte!!!! Today I did made a card using the adorable image "Daisy" from the Sampler Edition #2 designed from Elizabeth Bell special for Susana's Custom Art & Card Design. She is so cute, I must say this edition is simply amazing, but I say that for others too,LOL. More cards to come . I am having just such a fun! She is coloured with Copics. I used the sketch made by Suzanne J Dean for Follow Your Heart . The yummy apple is for her the flowers are for the teacher, lol! I wish you all a fantastic evening or day! maybe you are thinking what she is talking about......Summer now, lol. Ok, well it's about my card. On the Digi Bells Blog they are having a blog hop with the theme "Summer time Fun". I coloured her with Copics in summer fresh colours combo ( one of my favorite). The frame around the image is from some kind of rubber, which I have got as a candy from amazing Suzanne J Dean. The ribbons and the papers are from my stash. I did made an Easel card with a twist. It's such a fun, only when you try to take a photo the fun is gone, LOL ! Digi Bells - Summer Time Fun! Hope everyone is well and enjoying the weekend! I did made a card today with the so cute and adorable image "Howdy" from Sampler Edition # 5 Elizabeth Bell for SCACD. You can buy her at Susana's store here. She have so much more at her store. Ohhh and by the way you get with your order such a cute little baggy with thanks stuff , LOL ! I coloured the image with copics and followed a sketch made by Lynda Nielson for GDT Call at The Digi Bells. I want to show you something very adorable and cute. The new "Wee" Stamps by amazing Sylvia are already in store here . I already bought my image and made a card with it, lol. I just love this cutie. Bunny Zoe's Crafts challenge # 9 - Spring... Flowers Everywhere! I Did It Creations Challenge - Bling it Up! Charisma Cardz Challenge - Spring Has Sprung! Papertake Weekly Challenge - Putting On The Glitz ! Samuel Taylors Monthly Challenge - Use Copics or Promarkers ! Today at the Crazy Challenge we do have a new challenge for you. It's all about Weddings and Anniversaries, just any of them........ you name it. Our sponsor this week is Digital Delights by Louby Loo. For my Anniversary card I did use one of the images provided by our sponsor- Love you Lara . I coloured the image with Copics and then used the cool stuff - Tonertex Foils and Glitter, which I have bought from SCACD. I hope will will come and join us this week at our Crazy Challenge! Here is my card for you today! I just want to share few things with you, which touch my heart. The first thing is a very precious award from lovely Becca , just visit her and give her some love. Thanks dear, I am honored. The second thing is a fantastic video I saw few weeks ago. Maybe you have too, but my heart was touch by this amazing Lady who sing so beautifly. Just listen to the song and the words after that. The 3rd thing is my card, made with the adorable image Grace, I bought my digi image from Funky Kits. She is coloured with Copics, sorry don't know the No. The gorgeous flowers are candy from so kind and amazing Jacque. I want to show you a card which I made few days ago. I just love this image , I am sure you will too, lol. 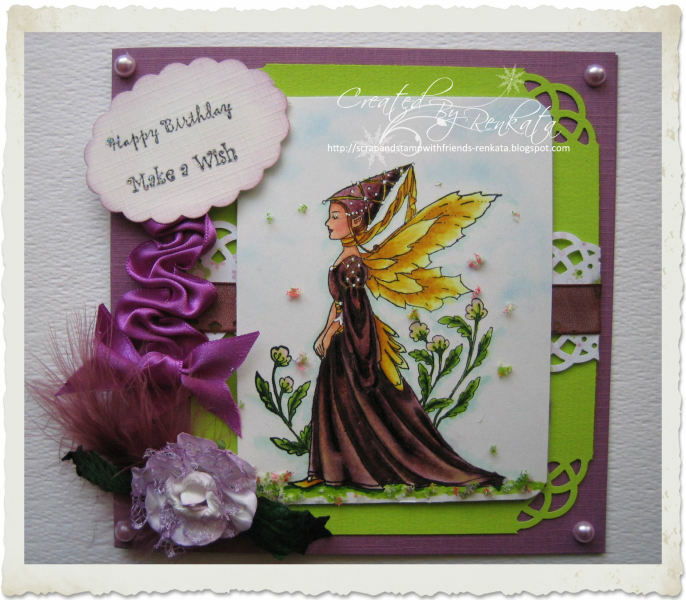 The image is Fairy Queen and you can get yours at Susana's Customs Art & Card Design . I wanted she to look gorgeous and magical just like Fairy Queen should be. I coloured her with copics ( RV99,95,93, 91 and over the dress Y00 very softly) to give this velvet vintage look. Hope you will enjoy it. I really do! Wish you all a magical evening or day! Today we do have a New Release at Spesch Designer Stamps. The new images are created by talented Sylvia. Check our blog to see what the DT came up with. I am showcasing the digi stamp "Princess and the Frog" by Sylvia. And you can have yours at Spesch Designer Stamps . Did you had a fantastic weekend?! My weekend was fantastic - crafting, crafting ........, lol. I want to show you what I have done today. I think it's turn out pretty well. From an old card I did made new one for Valentine's Day!!!! I did buy some simple Valentine's cards, but then I thought ...... maybe I can do something nice with it. The ribbon is from my stash. The gorgeous dolly is a candy from sweetie pie Stephanne . The red rose is from Wild Orchid Crafts. The little pearls are made with a Pearl Pen - which I have bought from SCACD. Stamptacular Sunday Challenge # 97 ~Hearts Gone Wild ! Are you ready for A New Day?! Well let me tell you that, I am so ready and so happy for this ~ "It's A New Day" Release at SCACD. I was so over the moon, lol, when Susana from SCACD ask me to be a part of this surprice release and the most romantic and sweet bloghop. If you don't want to miss all the fun, will be nice if you start the bloghop at the Store blog. If you come here from the lovely Alex, you are on the right place. Are you ready for a treat! Here is a piece of the most amazing cake ever. The cake is made by Victoria Case for SCACD and it's called - Celebrate. And here you can see the chic cake card made by me! The Valentine's day is almost around the corner and Susana at SCACD have the most cutes and romantic images from Elisabeth Bell for SCACD - The Spring Sampler . You can use the images for so many occasion. I did use the "Blowing Kisses" and "Cameo Rose"
Isn't she so sweet and cute?!!!! With Cameo Rose I did made a treat box full with heart chocolates, yummyyyyyy!!! Hope you enjoy my creations ! For the European International orders head to Quixotic Paperie who is an exclusive SCACD retailer. Ooopppsyyy almost forgot ,LOL. There will be a prize for you to win, just pop over to the Store blog and Store's Facebook Page to answer the question for a chance to win. Don't you worry if you buy the images today and you are the lucky winner, Susana will take care of that for you!!! The winner will be announce at the end of the day the 4th feb.10pm EST. Thanks, dear Susana for the invitation to be a part of this amazing bloghop and "It's A New Day Release"! Now head over to the sweet Danni. Have a magical day eveyone!